You can meet Santa Claus and cross the Arctic Circle every day at the Santa Claus Village near Rovaniemi in Finland. Of course, there are many shops inside the park selling a variety of items related to Santa Claus and the Lapland region. One of my colleague went there few weeks ago and bought me a nice pack of playing cards aimed to enhance the well-being of children and the kindness of grown-ups, as well as spreading the message love and goodwill of Christmas Spirit. From the ace of spade, I strongly suspect it has been printed in China but the thirteen figures are very charming. 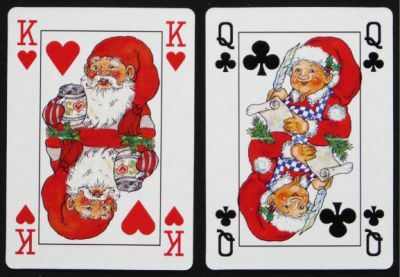 Cardmaker or editor: Pobra A/S, Danmark (www.pobra.com), the house of Christmas since 1938. Year of publication: 2012 ? Price and where to find: The price is around 25 kr from various Danish web shops (less than 4 euros).